On anchor at Benguerra, Kev woke me at first light at 05h00 with coffee and Stugeron. He and Catatude were ready to go. Feeling just a little bad that everything was done while I was asleep, I dutifully proceeded straight to the deck in my PJ’s and did my anchor lifting chore (you have go to the wet dew floor area just in front of the mast, press a button with your foot, shout or signal directions (also dependant on your mood) to Kev which way to steer to ensure that the anchor comes up in a straight line, and then once up you secure it with a shackle for passage.). Oh what has happened to the glamorous dream, where yachting is lazing on the sundeck, cocktail in hand with glass smooth turquoise seas surrounding you? We made our way through the sandbanks, sometimes getting as close to the land as 50m, with depths ranging from 20 to 3 meters and got to the gap between Benguerra and Bazaruto Islands which leads to the open sea. It takes about 55 minutes to get from the Benguerra anchorage to the gap. It was top of high tide when we arrived and we were ready for this monster called the Gap! There are 3 sandbanks to cross in the gap (so 3 sets of breaking waves to cross) and there is a narrow channel which runs slightly diagonally, which you have to stay in to get the deepest water. 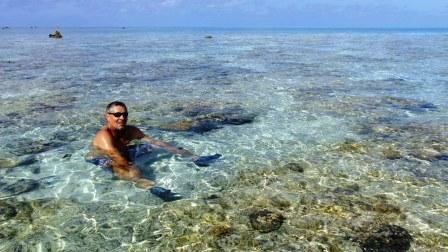 Of course there is also an underwater rocky outcrop to the left and two mile reef to the right. It can get very shallow where the waves break, so its only safe to cross at high tide. Its decision time because once committed you cannot turn back. Armed with our forward looking sonar, we proceeded ahead and after each sandbank/set of breaking waves, we both sighed a sigh of relief, as the depth drops to 1.3meters and Catatude does a little Macarena dance while passing through each wave set. As soon as you see the picture of the drop in depth on the forward looking sonar screen you know, your home free. What a fantastic gadget for shallow waters, worth every cent! The gap is a scary place because its 3 miles from start to clear and takes just under an hour. So with that hurdle behind us, we slid along the open sea. Be careful what you wish for, because you may just get it ! I wished for seas as smooth as glass and I got them ! Beautiful flat calm sea with the sky reflecting its every move into the shiny surface. So three hours later and we have only covered 12 miles! So that’s the trade! 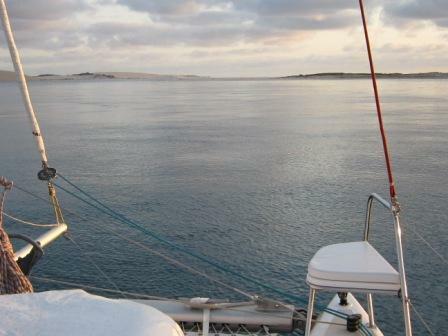 Smooth seas and no wind = snails pace or wind and choppy seas = faster arrival at destination. Why does everything have to be so complicated? Anyway, I took full advantage of the smooth seas, and tried to re-enact the Peter Stuyvesant advert by tanning on the trampoline, with the sea breeze blowing from below to cool you down, coke in hand (a cocktail may have invoked the seasick monster so that was too risky) enjoying the excellent weather. These days have been rare up to now but hopefully this will change as we follow the sun. Kev had a strike on his rod from a Black Marlin, which jumped high up into the air, did a back flip and disappeared with the lure and 900 metres of fishing line. It was very nice to see how high these huge fish can jump out of the water. 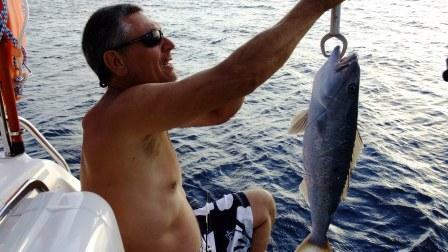 Obviously Kev’s fishing gear is not meant for such huge fish and was totally inadequate. We had sundowners on the deck and watched the turtles swim by gracefully, whilst the flying fish were flying all around us and the marlin jumping several times. There were also many, many blue bottles! Early morning brought choppy confused seas with the wind from the South East at 19 knots even though the web weather prediction was a max of 14 knots. Fortunately there was no swell, so Kev put up the Genoa and the mainsail on 1 reef, switched off the engines and we were sailing! How rare it is. Up to now we have done most of our sailing assisted with a motor (known as motor sailing) and today we get to have no engine noise just the gush of the water on the scoops and the wind. Its quite an exhilarating feeling to be moving at an average of 7 knots by the courtesy of nature. And, I may add, quite an art to getting your sails all setup to harness these forces of nature. This is the constant quest of a sailor : to find that perfect combination of wind, sea state and clear skies. By early evening the wind hadn’t calmed down but had picked up even more, so we had to drop one sail so that we could slow down – we didn’t want to arrive at Bassas in the dark and we were making such good progress that our eta was 02h00am! We also learnt that shared evening shifts don’t work. Kev thinks he will have a 40 winks because I am awake and I think I will have a 40 winks because he is awake! In the end we are either both having a 40 winks (in front of the telly) and the boat is unmanned or we are both awake and sleep deprivation sets in. At first light I saw the now familiar triangle on the horizon. Bassas wreck was in sight! We put up all our sails and sped (ha-ha, that’s our 11kms/h speed) to get there, the turquoise inner circle, getting brighter and brighter as the sun rose in the sky. 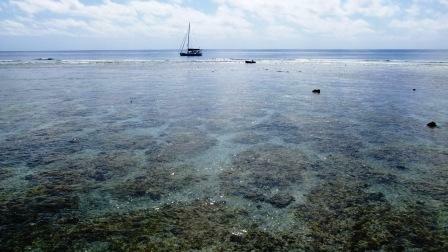 We arrived at the eastern side of the atoll at 9am and secured Catatude to the anchor/mooring. We knew the eastern side of the atoll would protect us from the prevailing southerly wind. It was just breathtaking – absolute flat calm seas with the tide fully covering the rim, and no protruding objects except for the skip wrecks on the opposite side. 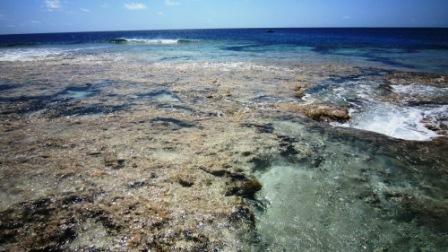 The only signs of a huge atoll underwater being the variation in colour. We could clearly see how a ship could sail straight into Bassas, at night, without the colour variation to warn you of the extreme impending danger ahead! At high tide she just blends in with the horizon no waves, no rocks, no sounds. Nothing. Its what makes this place so mysteriously special. Incidentally, the radar doesn’t paint Bassas (its too low) only one small blimp on the screen, which shows the shipwreck. It was 28 degrees and a beautiful hot and calm day. We settled in, washed the dishes, cleaned up a bit, lowered Landy, showered and had a good brunch. At 13h00 on the high tide, we went ashore onto the rim. This time the Landy was a bit of an issue because we couldn’t just drag her onto the shore as we had previously done with the bakkie. We had to find a loop in the rock that we could tie her to. Kevin had a bit of the paranoia here that she would be washed away if the rope was chafed in the sharp rocky floor, so he stayed close to her and stood guard. We wondered around on the most eastern point marvelling at the huge schools of parrot fish (this time both male and female (the females are brown and the males electric blue), morays and even a turtle. I tried hard to find some evidence of treasure but they are probably all encrusted with barnacles and growth so not easily spotted. Kev caught a baby barracuda on the tender on the way home but he let it go as eating barracuda can give you ciguatera poisoning. Back home Kev caught another beautiful red steenbras for dinner. He attempted to clean it and there were just fish scales everywhere (hopefully his fish cleaning skills will improve soon – Pedro please, a lesson or two is urgently needed!). I was of course constantly spraying down the area (and Kev) with the deck wash hose on the transom. All the resident sharks came to see what the commotion was about and gratefully accepted the off-cuts. Kev made a fresh batch of 400l of water and used it all on washing the salt and sea residue off Catatude. Its rinse, wash with suds and a broom and rinse again. The layer of salt that deposits on every rail, handle, outside surface is unbelievable! Don’t even think that you can hang towels on the railings, to dry, once you’ve done a few days at sea! They dry out hard and crispy where the salt has dissolved and been absorbed into the fabric! Gee, I moan alot hey? There is a big upright anchor on the rim, which you can see when you sail past at mid tide. This anchor is about 2 miles from our anchorage and impossible to reach by Catatude (too dangerous), and very difficult to reach by tender as the waves break heavily and the ledge extends out very far and is very shallow. But, I really wanted to see it, so I started the gentle nag. Should, we go and see it ? (to gauge the reaction and level of sucking up I needed to do). Then the sob story of how its part of Basses and you can’t leave without seeing it, and how special it would be too see it, and how few people in this world have seen it, and on and on and on. Vads, you know how it goes! Eventually, after the return lecture of : you are causing me to do irresponsible things, a skipper never leaves his ship unattended, I promised your parents I would look after you, what if the Landy’s engine packs up and we go adrift?, what if Catatude starts drifting and we are so far away?, what if the tenders line snapped and it drifted away leaving us ashore?, etc, etc, etc. Finally, Kev agreed (I think only because it’s my birthday tomorrow!). Shoo, hard work that one! Kev got the Landy ready (it was like going camping!) : spare tender motor (Lexis’s motor), full tanks, extra fuel, life jackets, 12L of water, first aid kit, survival kit, extra towels, torch, crisps and snacks, spare GPS (old flying 296 GPS), hats, coral shoes, fishing rod and of course the portable sat phone – he wasn’t taking any uncalculated risks here! I just smiled because I knew he was right but he was doing it for me! Shame Kev, sorry for putting you in that predicament (but it was worth it). So off we went, with an hour spare to reach the anchor by 13h30 at low tide. The weather was still beautifully hot and the sky was semi cloudy/clear. The sea was relatively calm except for the area where there is a narrow gully through the rim. Here the breakers break deep out to sea. I noticed that at bottom of tide (lowest, low tide) the water doesn’t recede fully on this section of the rim (Perhaps at spring tide? ), so when the tide was at its lowest we still had 30cm of water on the rim. Kev secured Landy as best he could with the tender anchor, we unloaded his “survivor essentials” onto the highest point that was not submerged and proceeded to explore this section of the rim. This section had much more marine life than the eastern side, and was littered with debris. Old anchor chains, bit of metal, pipes, poles and various other indistinguishable item. The marine life is also much more prolific here, probably because the area is almost always underwater. It is a nursery for fish, hundreds and hundreds of smaller fish dart from pool to pool as you approach. 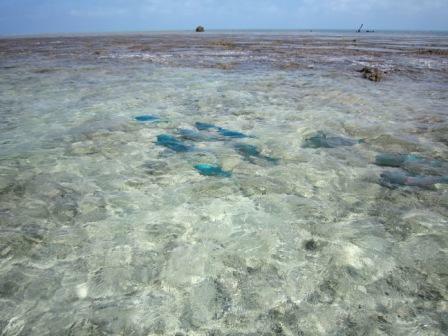 The Bassas parrot fish are especially plentiful in this section, chomping on the corals in the shallows. Then we went to the upright anchor, and bonus, bonus, there were two! The second one lays flat on the surface. They are huge. I can only begin to imagine how big the ship was that was carrying these anchors. 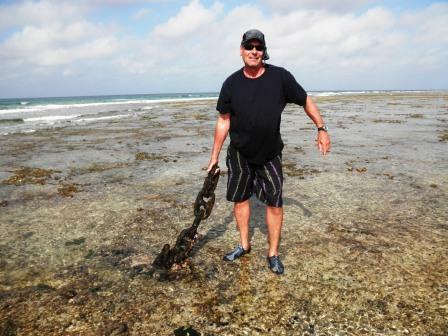 I believe this is the spot where the 5 story ship hit the reef and was sheared in half. The bottom section of the ship remaining on the outside of the atoll and the top floors of the ship ended up on the inside of the atoll at 12meters. We spent a long time walking about and inspecting everything. We wondered how many men it would take to lift this huge anchor and chain or what contraption they had in place to lift an anchor and chain of this size. Each anchor chain rode is as long as Kev’s size 9 foot ! We left when the tide was thigh high making every moment of this special place. Satisfied we headed back to Catatude by tender, armed with hundred of photographs and memories etched forever. Back ‘home’ Kev caught and released a fish, we think its a Job fish (it weighed 2.5kg)? Pedro/Deon help us out here, are we correct? The fish thing is quite a stress because every-time we catch a fish, I have to scour through the fish identification books, very quickly to see what we have caught and if its edible before releasing it. Its a pressure because I feel so bad for the fish hanging around waiting for me to decide : life or death. Being the ultra animal lover, this is extremely hard! The fish give me the ‘puppy eyes’ look, every time. I’m such a sucker! 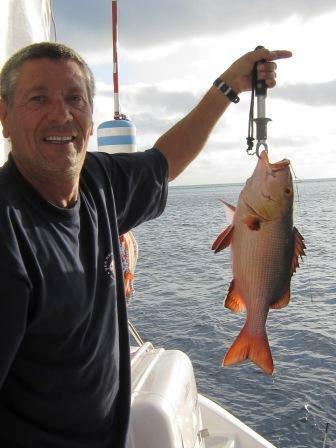 There are only ultra large fish at Bassas. No half measures, no pan sized fish. Boy, today is going to be hot. The gauge shows its 30 degrees already and the day has just begun. Its my birthday and I know that one of the parcels that came, are my prezzies ! The sat phone rang early and I sipped my coffee to the tune of Vads, Mom and the dogs howling the birthday song to me. 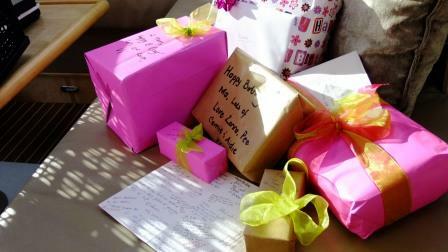 After coffee and breakfast, I opened my gifts and cards. Thank you, to all of you special people that made me feel so special, and to all the people that phoned and emailed. It was great, I didn’t feel one bit isolated! The gifts were stunning and will be put to good use soon. Our girls, are so special – I love you all HARD! 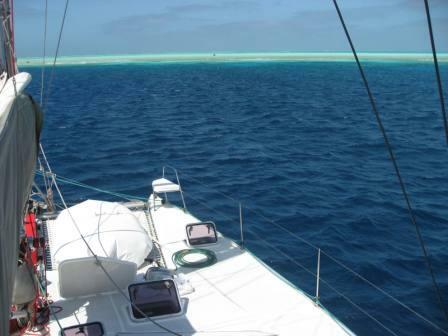 We decided to up anchor today and sail around the southern side to the north western anchorage, so that we have sailed full circle around Bassas. We were visited by a pod of spinner dolphin, which swam with us for a while then retreated to the side to do a spinning acrobatics display for us. The southern side of Bassas is the rough side. The drop off is much deeper and goes down to over 1000m at times. The waves crash against the rim here and they are so big that I think it would even be possible to surf here. The sharks are also much bigger and much more plentiful here. We passed a wreck sitting on the shore, its nose bent up to meet its centre, clearly showing that it hit the rim ledge head on, possibly on route from South Africa. This beautiful place is capable of extreme destruction. 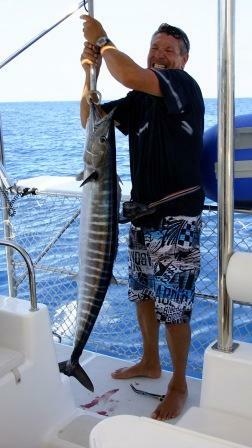 A little further, the fishing rod went crazy and Kev spent the next 20 minutes reeling in a ‘big one’. It turned out to be a Wahoo. He was big and while Kev was making sure that he was fine to release (running water through his gills until he was strong enough to swim away) four sharks were already circling. The sharks are really big and in the end we had to reverse to chase the sharks away, so that the Wahoo could get away and swim to safety. Kev lost a few lures at this spot and apparently 2000metres of fishing line, with the fish being so strong and big that they bite through the steel trace or dive deep down with the lure taking all the line off the reel until the line snaps. As we continued we saw the ‘original Bassas wreck’ which is two halves of a ship next to each other. We spared a though for the poor people stranded here, with false hope of rescue, that were on either of these wrecks, as well as the people on the more than 50 wrecks that lie on the ocean floor outside the rim. 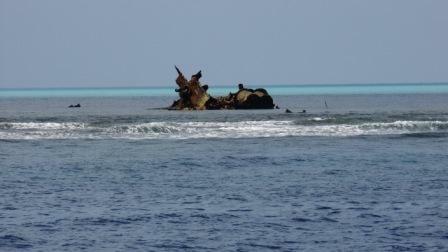 This is the wreck that one sees first, as a small triangle on the horizon, when approaching Bassas. See the photos page for more pics. Four hours later we were at the anchor point, on the NW side. This atoll is so badly charted by all the charts, including the paper charts that I wouldn’t consider going anywhere near it unless it was ‘a very sunny day with good visibility, and at low tide’. Some of the ledges just 1m underwater, extend out as much as 200 meters, with sheer drops to 1000 meters below. An evening encounter with Basses will be fateful! 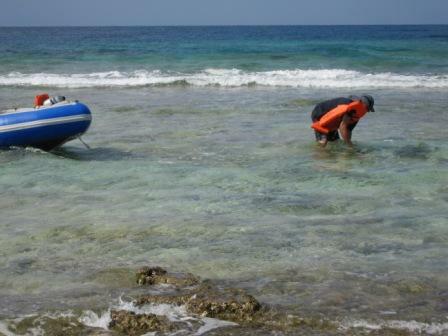 We attached Catatude to a buoy (which is in extremely poor condition, rope wrapped around several coral bommies (a very tall coral mound), waiting to be chafed, only 40 meters from the ledge). The wind was blowing from the south so it was blowing Catatude away from the atoll. If the wind changed direction we would have to leave immediately. The depth was 13 meters and the visibility was so clear that we could see the mooring lines path, as well as the reef fish and sea cucumbers on the bottom. 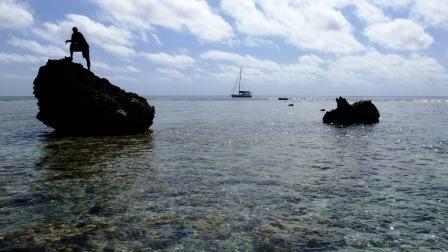 We went ashore on Landy again and spent the next 2 hours marvelling at the wonders of Bassas. The inner turquoise was ultra blue today as it was very hot and sunny. Kev even had a mini swim in one of the many rock pools and I was taking photos at every step. The scattered rocks on this section were very big and high. We suspect that one rock, the biggest one may just stick out at high tide as it was the only place on Bassas that we had seen crabs. Again the area was scattered with metal bits of ship wreck. I tried my luck at getting Kev to go to the ship wreck by tender (again about 1,5 miles by tender, by cutting across the inner rim at high tide) but this time he was adamant. “No way, the anchorage is not secure.” I know when to quit, when I have no chance, but still you have to try! Its a chick thing. We had, had 3 glorious weather days at Bassas, and as we were still 250 miles away from mainland, we (well Kev) decided that tomorrow morning at first light we would proceed to The Barren Islands just off the coast of Madagascar. The weather window we have chosen has been fantastic since last Saturday and as we will only get to Barren by this Saturday – expecting 8 consecutive days of excellent weather was pushing our luck. Kev made me a special chicken for my birthday dinner. Now, don’t laugh, (for us its a treat) we have calamari, prawns, crayfish etc on a daily basis! But, chicken? You don’t find any of those running around the sea! Catatude, was ready for departure and after dinner, we sat on the trampoline, going over the days events, enjoying the cool breeze after the hot day. I was downloading my last emails at 7pm, when the wind shifted. We felt Catatude move around, but couldn’t be sure which way we were facing. Where was the reef? There were no sounds of waves because it was high tide, no moon, pitch black. No reference. The spotlight, just illuminated sea, every way we looked. The GPS shows where you are in the world but not which way your boat is facing. It showed us next to the reef but facing the way we had originally stopped at. We knew that if the wind shifted we had to leave immediately! That was now. Kev took a bearing from the Navnet and the yachts compass, while I desperately tried to get the night vision binoculars to work. Keep calm, keep calm. (Very difficult when you know the reef could be meters away). I gave up on the night binos, and took a reading from the Steiner day binoculars, which have auto focus and built in compass heading, as well as from the Maxsea GPS. We compared all the readings ( which varied between 2 and 10 degrees) and decided on a course. We dared not reverse incase we back into the reef. 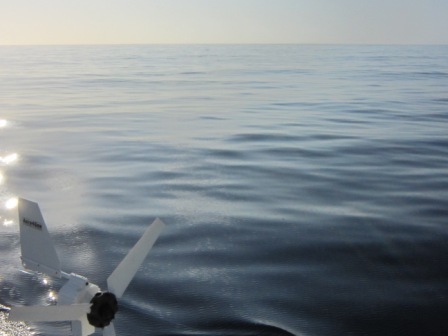 Kev turned the steering to 360degrees and punched a position onto the Navnet at 360 degrees. He started the engines and with anticipation and in extreme silence he pressed the “go to button”. We waited for something or nothing . . . . and then we saw the depth meter go from 13 meters to 12 meters to 11 meters. It was becoming shallower instead of deeper! The forward looking sonar showed a small reef before the decent of seabed to 15 meters, 20 meters, 50 meters, 280 meters. They say a picture paints a thousand words, well today it painted two lives. We were so relieved, we just hugged each other. Definitely, one or two more gray’s for both of us ! We discussed the situation we had just had. Firstly neither of us panicked. This is very good. Secondly we both remained calm and used all the tools at our disposal to assess our options (Anyone interested in night vision binoculars?). And thirdly we discussed and compared our options and agreed on the way to proceed (thank goodness, imaging having an argument about which way at that critical time?). We make a good team! Well, at least I can say that I was the only person in the whole world that celebrated their birthday at Bassas Da India on 1 September! Because there was no one else around! It was a very special birthday, one which I will always remember! We are on route to the Barren Islands at present, and conditions are fabulous! The sea sick monster has not even visited me once, hence I am able to write this newsletter whilst sailing! Luv you all HARD ! and Happy birthday Kev Knysna for today (2 Sept). Next newletter . . . . .